Hanging precariously outside a seventh-storey window, this is the dramatic moment a bride-to-be was saved from falling to the ground below. 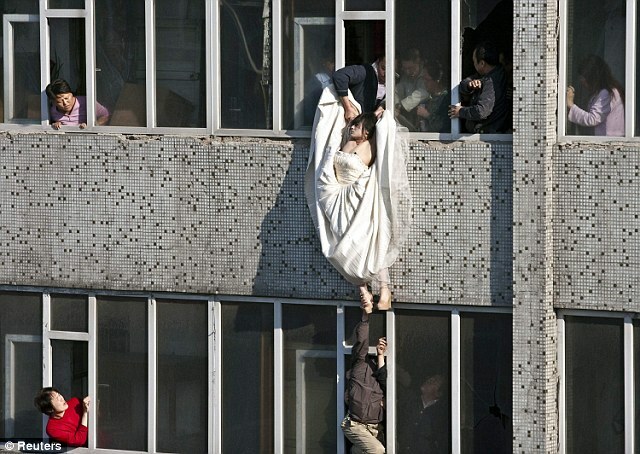 The desperate woman had clambered out on to the window ledge of a residential building in Changchun, Jilin province in China, dressed in a flowing ivory wedding gown. As horrified onlookers tried to talk her away from danger, the bride-to-be was about fall when she was saved by a local community officer. Residents leaning from surrounding windows were seen staring in disbelief as the unidentified 22-year-old climbed through a narrow window.